With March reluctantly giving way to April, as it is wont to do, spring has well and truly arrived, notwithstanding the brief rainstorm that rolled through Pelicanland late Sunday and Monday. That final salvo was Old Man Winter’s last desperate attempt to disrupt the lives of the flock, which is a bit ironic, as we would have welcomed a bit more disruption just a scant few weeks ago. Ever since January, really. So what is this spring fever? What is it that makes your heart ache because you want it so much? Why, rugby, of course. More specifically, playoff rugby. This is the time of year where teams either make that final push to secure bonus rugby or officially designate this as a rebuilding year. Hope springs eternal in the breasts of all ruggers, whether it is hope for a trophy, hope for next year or something in between, but all of us hope. There weren’t too many games this week as most competitions had a BYE week to allow for any rainouts (seriously, rainouts) so this week’s HP will be a little on the lights side, but make no mistake, we will be back in full squawk next week as a full slate of games hit the schedule. For those who are looking to advance to the local playoffs in April and the national playoffs in May, I leave you with one more inspirational quote. We are reaching the business end of the 2014/15 season so to that end we need to know availability so we can assign Referees, Assistant Referees, and Referee Coaches/Performance Reviewers/Other Names I Have Thought Up for the conclusion of the season and playoff matches. Please ensure we get your details by going to assignr, logging in, and posting availability. Missoula drove up in a bus with the Missoula Maggots painted on the sides and they were pounding on the windows: I knew this was going to be good. Gluttons for punishment, Missoula played Thursday against Reno (and won). Friday against Chico (lost in a good game), Saturday against Colusa and then. after partying from 5:00 till 12:00, took the bus to Portland for a Easter day game at 1:00 PM. 4 games in 4 days! 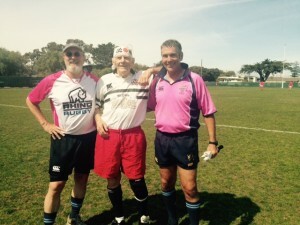 Big, muscle bound ruggers they were, but Nor Cal rugby we be! Big time friendly with a boat race to decide the kick off (OMG). A very solid rugby game ensued, with Colusa collecting most of the penalties and Missoula taking the lead. Colusa finally got it together and got back on top right at the half, 17-14. Both sides had 30 plus players, so a lot of substitutions were taking place and Colusa had the deeper team and pretty much took over in the second half. Great comradery on the field amongst the players and it was a great rugby day. 46-21, Colusa. The party was awesome with pulled pork, sausages, salads and a lot of beer. Thank you to the Montana refs that AR’d for me, Skip Hegman and his brother, Psycho Hegman!! EDITOR’S NOTE: I have been on the famed Maggot Bus while touring with the Modesto Harlots as the Hosted Side of the Missoula Maggotfest. Great times were had (Maggotfest is highly recommended) and just about everyone on the team was ill the next week. It was an experience I will never forget, though sometimes I try, especially when thinking about that bus and the things that went on inside. Back up to Napa’s heavenly field through Carneros. Fog had limited numbers but stood firm in their pack. Problem was their backs looked like tackling dummies as Napa’s Islander backline (fed amply by their captain, coach & #9 Paul) finessed their way to score beginning at a pace of a try every 2 minutes & only slowing down to miss most of their 1st half kicks or they would led by a lot more than the 65-0 halftime lead they built. They only ran over 8 tries in the 2nd half (to 11 in the 1st) but Tomasi (Fijian outside center hit almost all his conversions). The Fog had possession on Napa’s 5 meter line for a few minutes & a few penalties but failed to score a try & missed their one long shot at 3 points with a stiff wind blowing against the kicker. In fact they were way ahead in the boat race but got screwed by their #4 drinker who collapsed as Napa again breezed by them. Should make for a very interesting & competitive 3rd division playoffs as Napa is peaking at the right time. Field did not have sideline flags. Home team said they couldn’t find them and finally put out tiny cones that were hard for the players and ref to see. Another fine day for rugby. The sidelines began filling up and by match time were end to end. Both teams were very patient: Sac St. controlled the ball the first three minutes, rarely making the gain line, yet continued to chip away. Rarely did a team engage a ruck while on defense. Chico drew first blood with a nice chip by their flyhalf, putting their wing into space for an easy try. Another chip followed shortly thereafter to the other wing. Chico up 14-0. But Sac St. showed tremendous heart and clawed its way back with great passing, captain Travis being the beneficiary and toeing it in the last 25 meters. This was followed by a lighting quick try by their wing. 14 all. Chico elected for a penalty kick near halftime and closed out the stanza 17-14. Sac St. ramped it up in the second period, scoring first on repeated pick and goes to lead 19-17. Chico responded with another penalty kick to go up by one. Both teams were knocking on the door, each being held up in goal. Sac St went ahead with kick penalty taps, had Chico on the last foot, then dove for a try in the corner, unconverted. The game continued to go back and forth, each teams’ patterns matching the other. Then the ball squirted out from a Sac St. ruck, Chico flanker pounced on the ball and pick and drive did the rest. Chico up 27-24 with ten minutes remaining. Chico had a penalty advantage when their inside center made a line break and kicked the ball, was the recipient of a strange hop and scored in the corner for the final score. Great match, great sportsmanship. Sac. St. #7 was all over the pitch making plays, inside center Zach ran very hard, and #13 was a very elusive and effective runner, while the wing and replacement fullback were dynamic, yet received little ball. Chico St. forwards were big and physical, yet the Sac St. crew were their equal. Chico’s big center JW was devastating with his runs and the wings show good pace as well. The flyhalf controlled the game well and 15 made incisive runs. The match started with physical play by Sac State and they jumped out to an early lead. After explaining to the Chico captain that I would penalize for dangerous tackles, not hard tackles, Chico got down to business. The Chico flyhalf started their scoring with a drop goal from about 20m out, the first I had seen this season. Chico was successful in stringing together multiple phases, keeping constant pressure on Sac State. Sac State’s strategy of trying to get the ball to their strongest backs just never got any traction. After a decade in the bay area, I was looking forward to my first time inside Boxer Stadium at Balboa Park in SF. Between 1996-2003, the US national rugby team played 16 test matches at this venue against some of the best teams in the world. Now, Boxer stadium is considered just a “soccer-specific public stadium” owned by the SF Recreation & Parks Department, which charged SF State University an exorbitant $1000 for just four hours of use (12-4pm). At that price, it’s no wonder local teams don’t use this stadium more often, even though the picturesque setting is well-suited for high-level rugby. The D1AA game itself was one-way traffic, with UC Davis leading 55-0 at half and notching 20 tries in total. A beautiful sunny day at Boxer stadium. Fun fact, the USA Eagles used to play there. Thanks Aruna for that bit off knowledge. Onto the match. It was a high spirited match by both teams. However, SF State started off the match having to play with some players from their A side. Despite having to repeat players they put up a good fight sprinkling into the mix a hint of cheeky play. But the depth of the Davis was too much for State. We all had a blast during the match. This was a good competitive match played between two well organized and physical sides on a rock-hard pitch at SFGG. After pounding on the door for a while in the last minutes of the match, Blues scored almost on full time to break the 10-10 deadlock. The conversion made the final 17-10. Another beautiful day of sunshine at what has to be one of the most spectacular pitches in the country, as SJSU visited UCSC to contest the MacBeath-Porter Cup, named for the founding men of the two clubs. UCSC kicked off towards the ocean, and it took 17 minutes for the first points, with the visitors grabbing a try. UCSC pulled back level with a score in the 29th minute, finished by a no look behind the back offload to the scorer. After conceding a couple of defensive penalties, UCSC found themselves a man down after not being back 10 at a penalty, but despite the deficit, scored right at the end of the half to go into the break up 10-5, after a very competitive first half. A great break by UCSC was stopped by a no wrap tackle, and the home side banged over the resulting penalty from the 22 right in front of the posts to extend their lead. With a tidier breakdown and quicker ball, the Slugs piled on the pressure in the second half, adding a converted try during their one man advantage, and adding another two scores in the 56th and 66th minutes, for a 32-5 lead with fourteen minutes remaining. As SJSU tired, and fell off tackles, UCSC exploited space to score another three tries in the last six minutes, the last a length of the field break from full back, and won back the MacBeath-Porter Cup. Thanks to Giles for his help on the touchline. With SJSU a little undermanned, the teams agreed to 25 minute halves and didn’t manage a score until 45 minutes had been played. SJS opted to kick a penalty from the 22m line – even then it glanced off the post before going over. UCSC were then galvanized into action and scored an unconverted try. Off the restart, SJSU applied pressure but knocked on 5m out and after the scrum, managed to clear the ball and end the game. I took the opportunity of a match in Reno to make a family weekend in Truckee – which was great fun. On to the match – Stanford was more disciplined than UNR – which was the difference. They split their four tries evenly between the halves. Approximately 30 minutes into the match I took a harsh (accidental) boot to the achilles. Joshua Pendergrass was watching the match and commented “I can’t believe you can even stand, let alone run” – although I’m not sure you could call it running after that. I lasted the rest of the half and about 10 minutes into the second, at which point my entire calf was cramping and I tapped out. Luckily Russ Wilkening had just shown up to cover the b-side match for me, and he filled in admirably. Thanks to Dave Williamson (who happened to be in Tahoe that weekend) for offering to observe me. When I got back to Truckee, my wife commented “I thought you switched from playing to refereeing to get away from contact injuries?” Indeed. I touched on hope at the start of this newsletter and sometimes the hope is just to keep playing forever. Fred Forrester was opposite William Webb Ellis when, with a fine disregard, he first picked up the ball. After chasing Webb Ellis down Freddy was credited with the first ever rugby tackle. True story. This entry was posted in News on April 8, 2015 by James Hinkin.